Green Funerals - Manchester, Cheshire & South Lancashire. With a few simple choices it is possible for a funeral to be a dignified, peaceful ceremony in harmony with the environment. A green funeral is the natural choice. 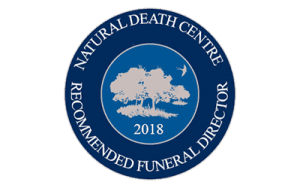 We were recognised as Green Funeral Directors of the Year 2013 and are recognised nationally for our expertise in environmentally friendly funerals. Our ability to help families to attain as green a funeral as possible is reflected throughout our personal and business practices, and we are one of the founder members of the Association of Green Funeral Directors. Some people have a definite preference for one or the other. For other people, the choice may come down to which is the more environmentally friendly. There is, sadly, no definite answer. There is no definitive ‘green funeral’. Cremation used to be considered the more eco-friendly option because of the reduction in use of open land for burial. There are, however, concerns about the pollutants released into the atmosphere during the cremation process. Some crematoriums in the North West have now modernised and cut their emissions to nearly nil. With others there are simple choices that can be made to reduce the potential for harmful emissions released during the cremation process. We also keep informed about future green developments such as promession. We do not feel it is necessary to embalm everyone that we look after at our funeral home. Only very occasionally might embalming be needed. Natural or woodland burial is increasingly becoming the environmentally friendly choice and the obvious one for a green funeral. Natural Endings has a vast knowledge of the woodland burial sites available for use in the North West, and can advise you on the benefits of each. We are regularly consulted for advice by new sites that are opening. Having a woodland burial helps to create a protected piece of woodland for future generations. The general principal is that a biodegradeable coffin (cardboard, bamboo, seagrass, willow or sustainable wood) or shroud is used. We have a large range of eco-coffins. At most woodland burial grounds a native tree is planted on (or close to) the grave. Often a flat memorial engraved stone or wooden plaque is used to identify the grave. The site is managed to encourage native wildlife, plants and wild flowers. Some grounds are privately owned or owned by nature charities. Others are areas in county council cemeteries. Alternatively we can arrange a burial on your own land. We have experience working with environment agencies to enable this. Find out more about natural burials.